On the last leg of our Israel trip, Kai and I traveled to Jerusalem. 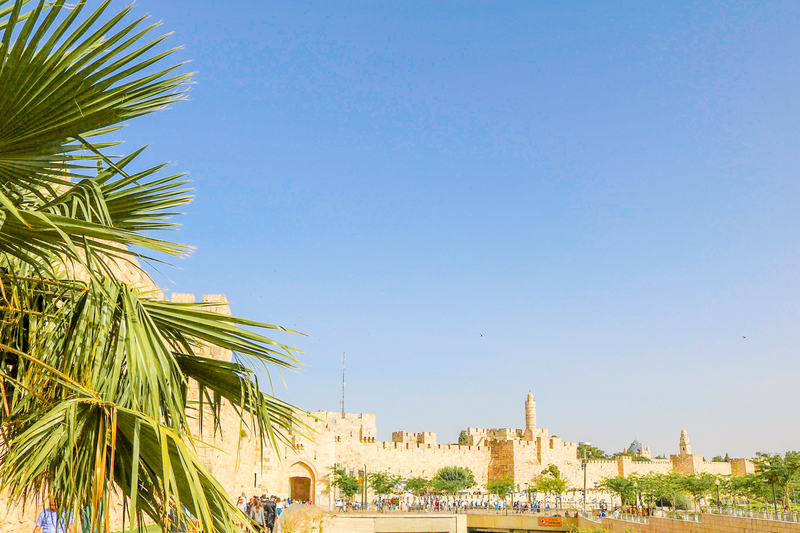 Jerusalem is the city that inspired our trip to Israel – it’s a mecca of history, religion, and some of the most holy sites in the world. 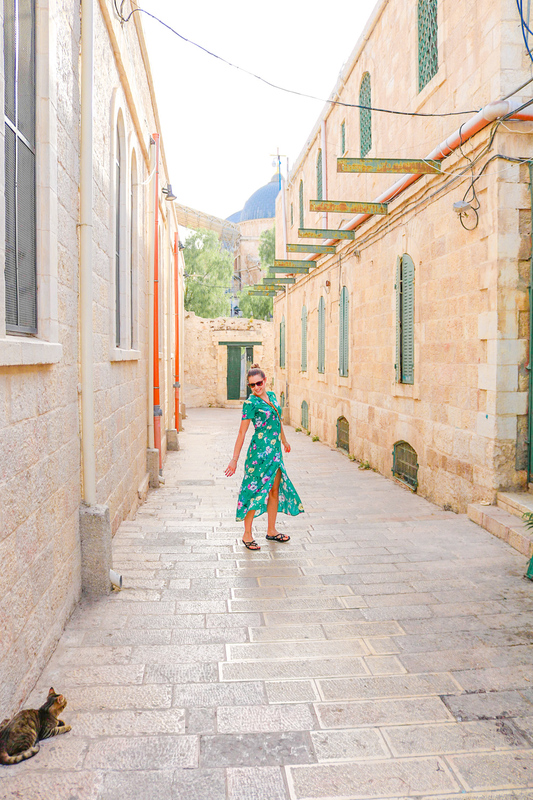 It’s also the backdrop of Ottolenghi’s cookbook, Jerusalem – one flip through these gorgeous pages and I knew I had to visit one day! As a Christian, I was incredibly excited to visit The Holy City. While Vatican City is considered the heart of Catholicism, Jerusalem is its bloodline. 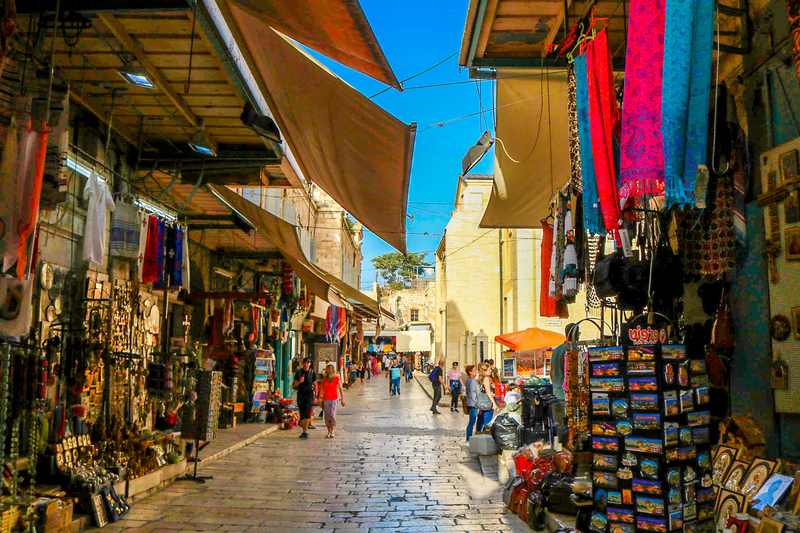 A UNESCO World Heritage Site, the Old City of Jerusalem set the stage for many biblical narratives, with sites such as Temple Mount, King David’s Tomb, and the Last Supper room – not to mention a labyrinth of streets and alleyways that Jesus and his disciples once walked. 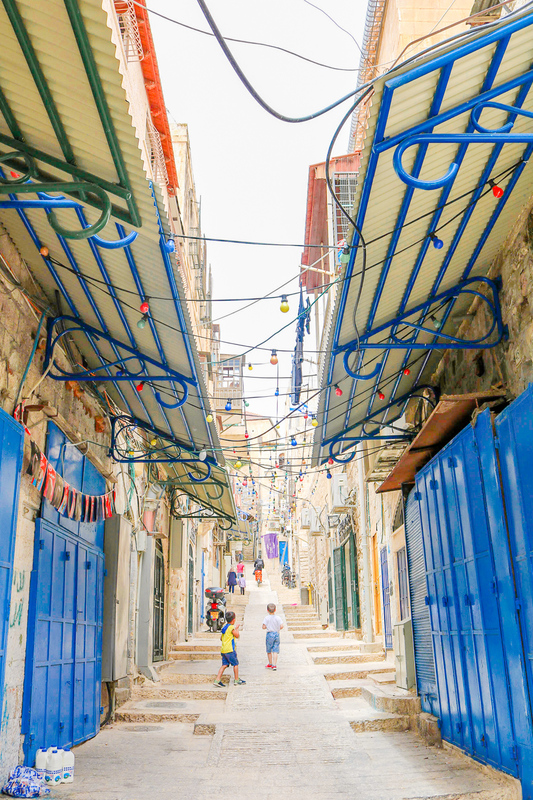 Divided into four quarters – Muslim, Christian, Armenian and Jewish – the Old City is a fascinating place to explore, with a religious significance that spans far beyond Christianity. In fact, as a Christian visiting Jerusalem, at times I felt to be in the minority, with so many vocal and excited groups of Jews and Muslims playing homage to the Holy City. As we were only in Jerusalem for one night, we decided to stay at a hotel. 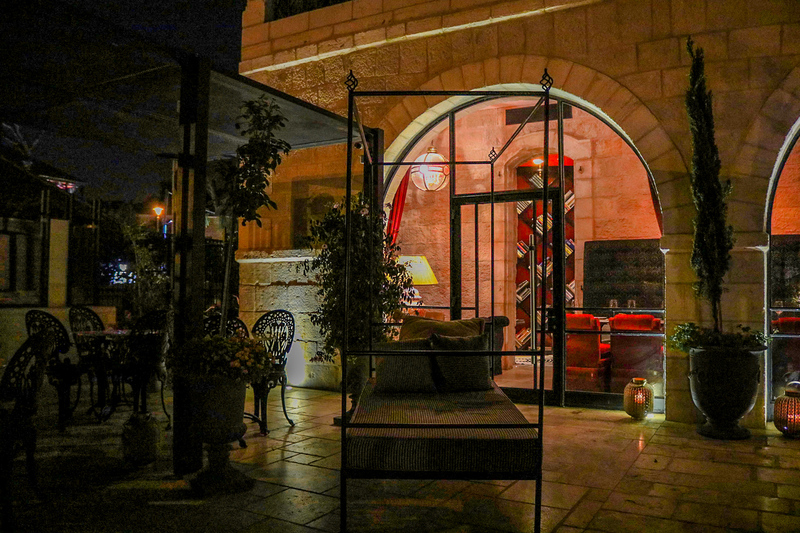 We knew we wanted to spend the majority of our time in Jerusalem’s Old City, so we booked a room at Villa Brown Jerusalem, which was a 10 minute walk to the Old City’s walls. We considered doing a tour of the Old City, which in hindsight, I really regret not doing. I am rarely unprepared on trips, but in the spring, Kai and I went to Vietnam and afterwards had a long string of guests in Amsterdam. By the time our trip to Israel rolled around, I’d had zero time to do any research on Tel Aviv or Jerusalem. 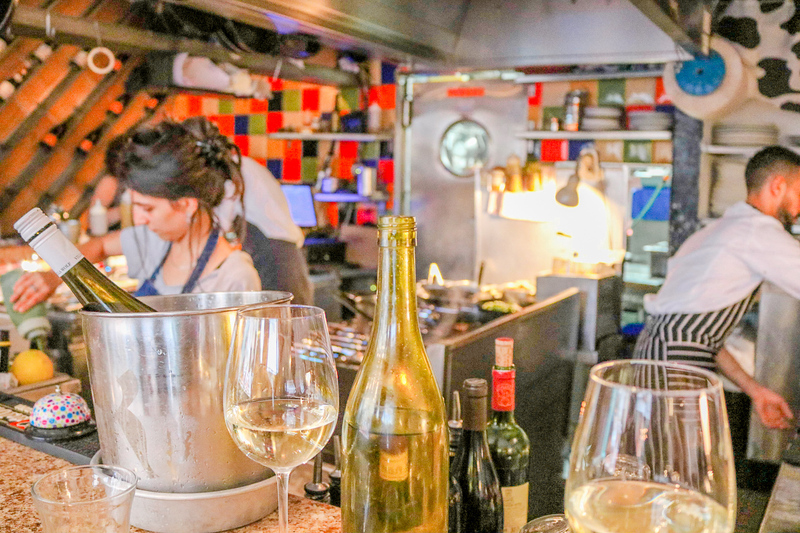 We got a handful of restaurant recommendations from friends who had been to Tel Aviv, but that was about it. 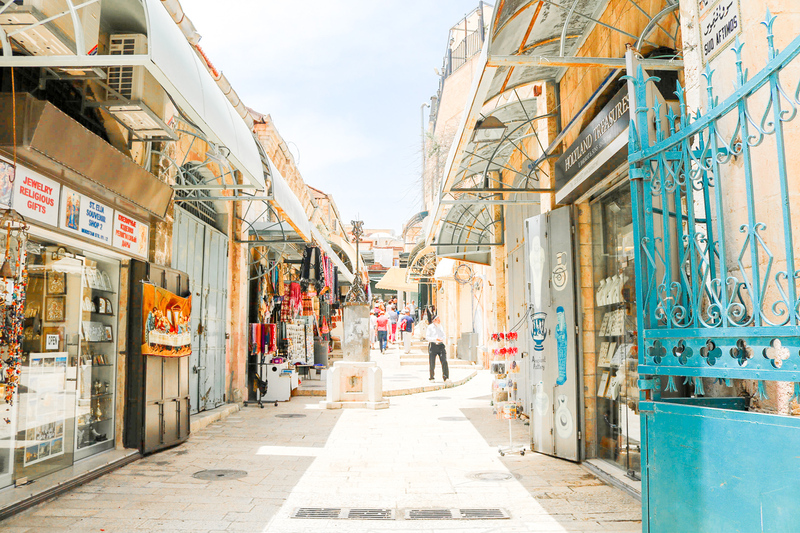 Even though we saw the holy sites in Jerusalem, I feel like we missed out on a lot of the historic and religious background of the spots we visited. So now I have to go back to Jerusalem again at some point ;) On our first afternoon in the Old City, we went to The Church of the Holy Sepulchre. The church is in the Christian quarter of the city, and is home to two of the most holy sites in Christianity. It is said that here Jesus was crucified, and here you will also find his empty tomb, where he was buried and resurrected. Just inside the entrance to the church is the Stone of Anointing, where Jesus’ body was prepared for burial. As we walked into the church, a group of women streamed in beside us and fell to their knees, kissing the stone. 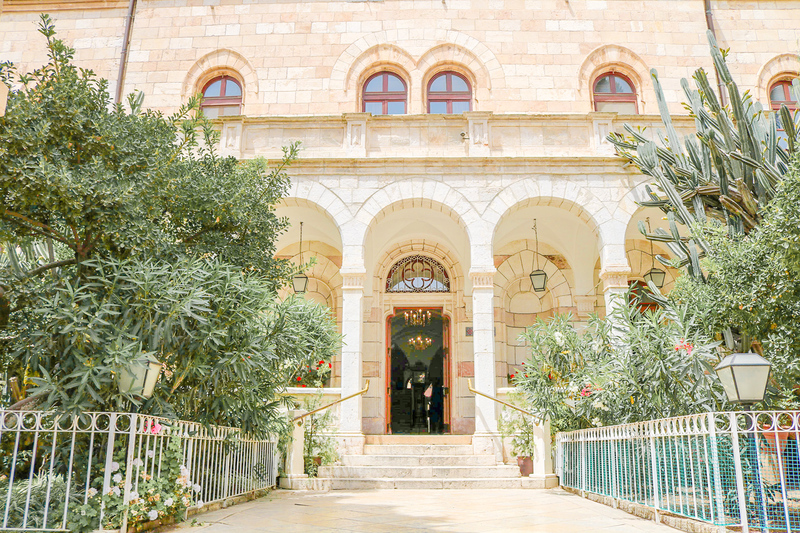 Just beyond the entryway is a stairway climbing to Calvary, which is regarded as the site of Jesus’ crucifixion. The Church of the Holy Sepulchre is actually split into two halves, one Greek Orthodox and one Catholic, each one with its own altar. The first room we visited in the church was the chapel, Aedicule, which contains the Holy Sepulchre and the Angel’s Stone. The Angel’s Stone is the large stone that is said to have sealed Jesus’ tomb, and the Holy Sepulchre is the tomb itself. You can just make out the tomb rising from the darkness under the church’s largest dome in the photo below. We then walked past the Altar of Mary Magdalene, under The Arches of the Virgin Mary, and finally past The Chapel of Saint Helena – the gorgeous Armenian church on the lower level of the Church of the Holy Sepulchre (image below). Directly below Calvary is the Chapel of Adam (image below). The crack in the rock here is said to have been caused by the earthquake that occurred the moment Jesus was crucified. This is one of the oldest chapels in the church, and the disciple Adam is said to have been buried here. The below photo was taken right before we exited the church, at the Chapel of the Dividing of the Robes. There were many chapels, alters, and smaller rooms within the Holy Sepulchre, and we spent more than an hour roaming through the many hallways of the church, checking Wikipedia every so often to get a quick background on the spaces we were discovering. Outside the church, the sun was starting to set. 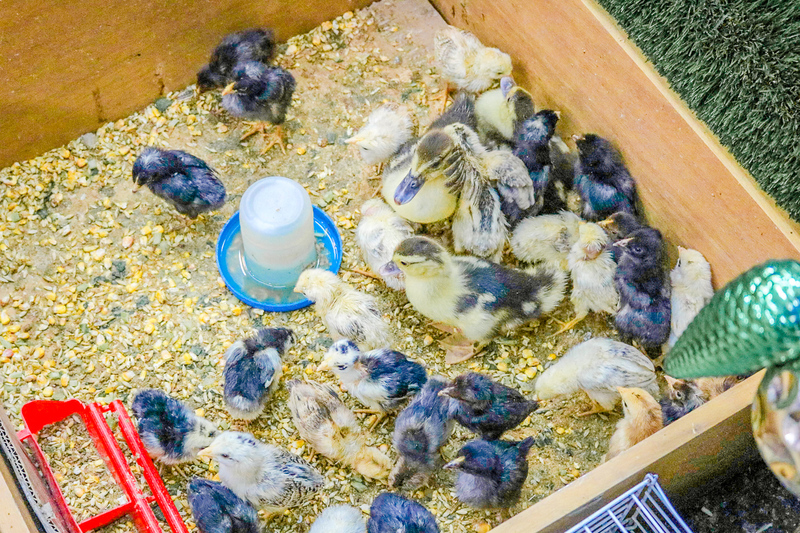 With food on the brain, Kai and I wandered through the Old City markets, looking for a snack. We roamed through the market, looking for a bakery that a friend had highly recommended to Kai. Unfortunately, when we found it, we discovered it was closed for the month! So we settled for a small treat from another nearby bakery (above), and spent a bit more time walking through in the Old City getting lost . . . and making cat friends :) How magical is this place?! Side note: Israel is expensive! The local currency is the shekel, and one euro is a bit more than 4 shekels. Buying food, drinks, and activities in another currency is always tricky because you never know exactly how much you’re spending. 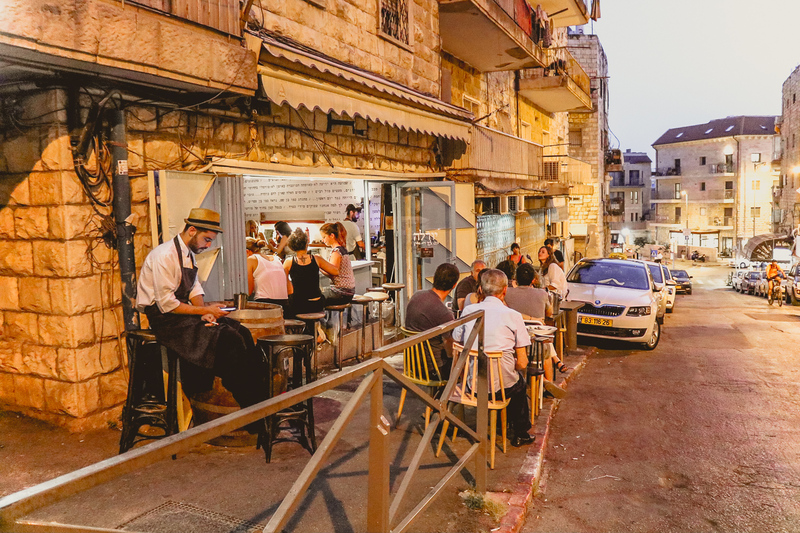 Overall, Israel seemed more expensive than Amsterdam – in Holland, a draft beer is usually around €4, in Jerusalem, it was closer to €8. This meal at Yudale was SO worth it, but our four small plates, bottle of wine, and tip came to about €85. In Amsterdam, it would have been closer to €60. No stress from our side, because it was vacation after all! But if you do go to Israel, make sure you’re familiar with the exchange rate in advance so you can ballpark the cost of food and activities that are displayed in shekels – it’s an expensive country. 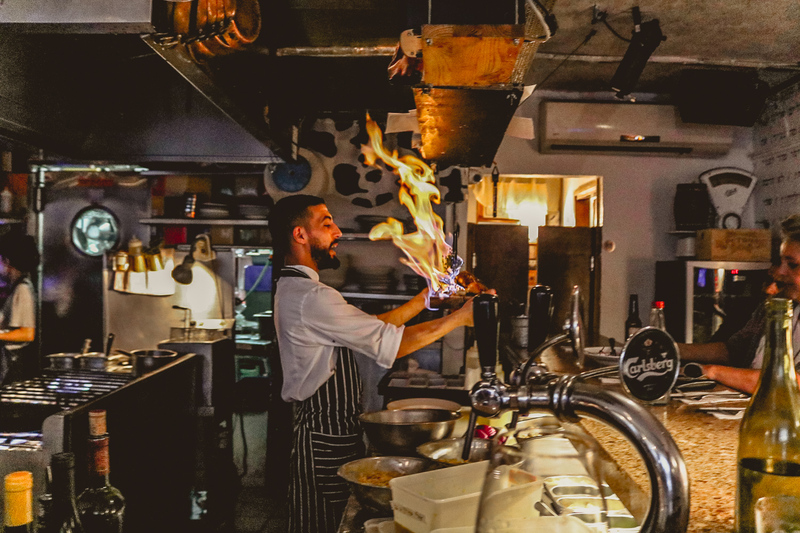 The meal was fantastic, and we’d highly recommend Yudale for any friends or family visiting Jerusalem! 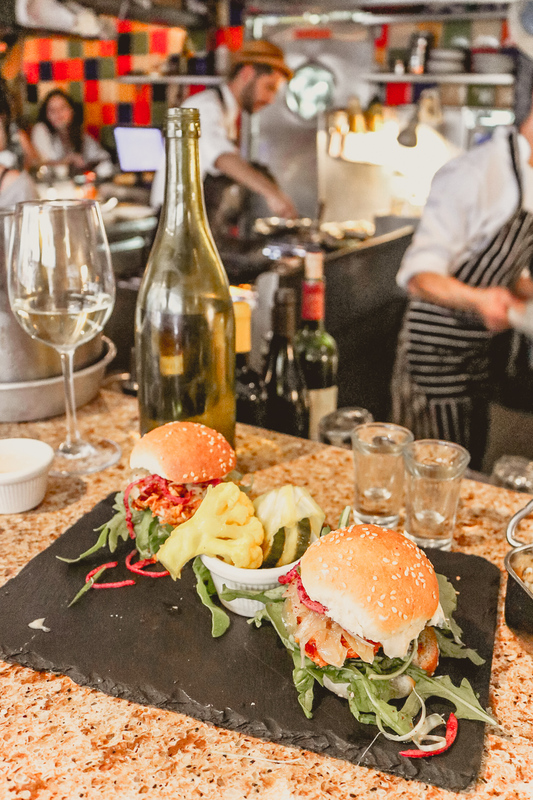 Were the four small plates at Yudale enough to fill Kai for dinner? Nope! 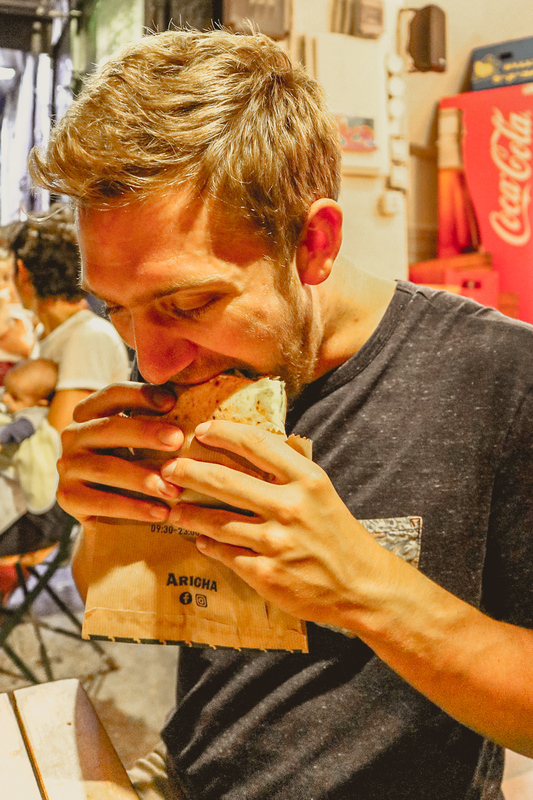 After we paid the bill, we walked over to the famous Mahane Yehunda Market to scout out some greasy grub so Kai could finish lining his stomach! We went into a hole in the wall snack bar, where Kai got an epic pita stuffed with salad, fried eggplant, falafel, hot sauce, and creamy yogurt dressing. It was beyond words. Afterwards, we walked around the market, which was starting to evolve from a daytime shopping mecca into an evening party venue. Bars blasted loud music, drinks were flowing, and people spilled out onto the street. Kai and I, having already consumed a bottle of wine, decided to opt out of the party scene and instead treat ourselves to an ice cream cone for our walk back to the hotel, which was about a mile away. How pretty is our hotel at night? The next morning, we had the BEST breakfast at Villa Brown! 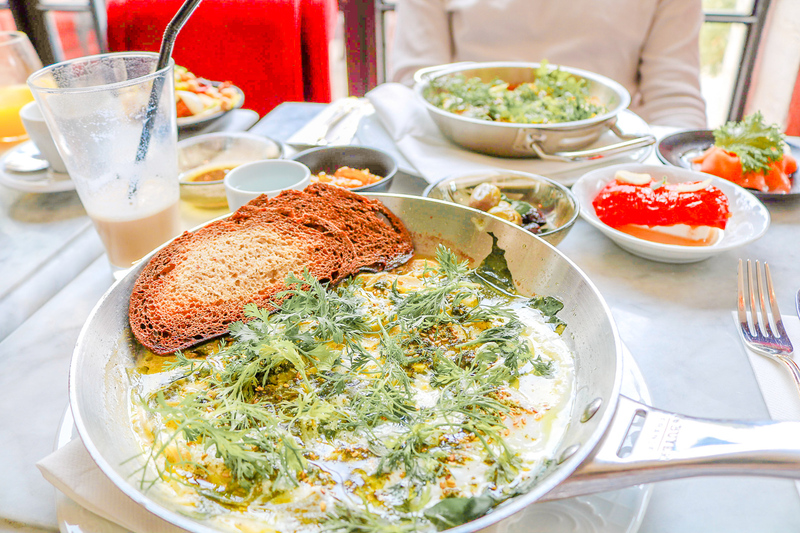 Included with our stay was our choice of a hot breakfast dish – I went for a sheep yogurt shakshuka with fresh herbs and Kai went for the classic tomato shakshuka with heaps of cheese. 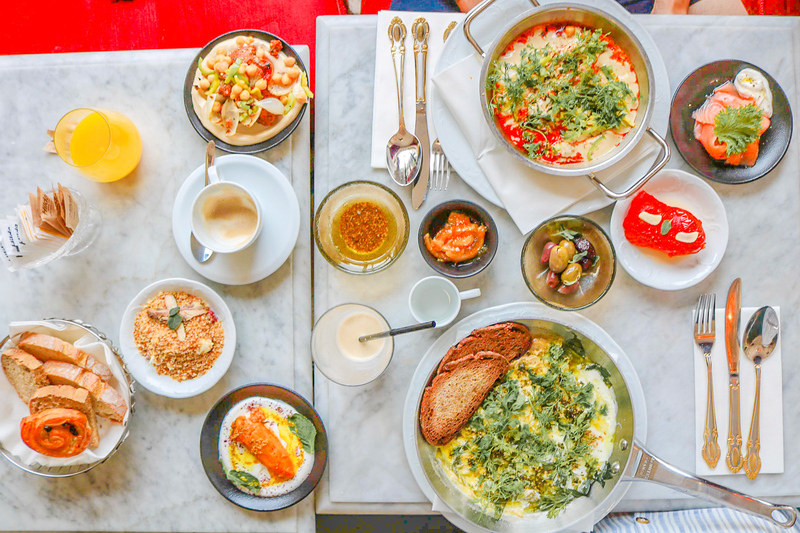 The eggs were served alongside dozens of small dishes, overflowing with olives, hummus, honey, yogurt, granola, stuffed peppers, salmon, and sweet potato. While our room at the hotel was quite small, I would have slept on the hallway floor if it meant I got to consume this meal for breakfast the following morning. It was spectacular! After our breakfast, we walked back to the Old City for more exploring. The wares at the market were all of my favorite colors – dusty rose, sage green, marigold yellow, creamy whites and charcoal grey. Our first destination in the Old City that day was the Western Wall. The Western Wall is considered holy due to its connection to the Temple Mount – Temple Mount is one of the most contested religious sites in the world. In Jewish scripture, Temple Mount is regarded as the site where God’s divine presence is manifested more than in any other place. It’s said to be where the world we know expanded from, and where God gathered the dust used to create Adam, the first man. For this reason, it is the holiest site in the Jewish religion. 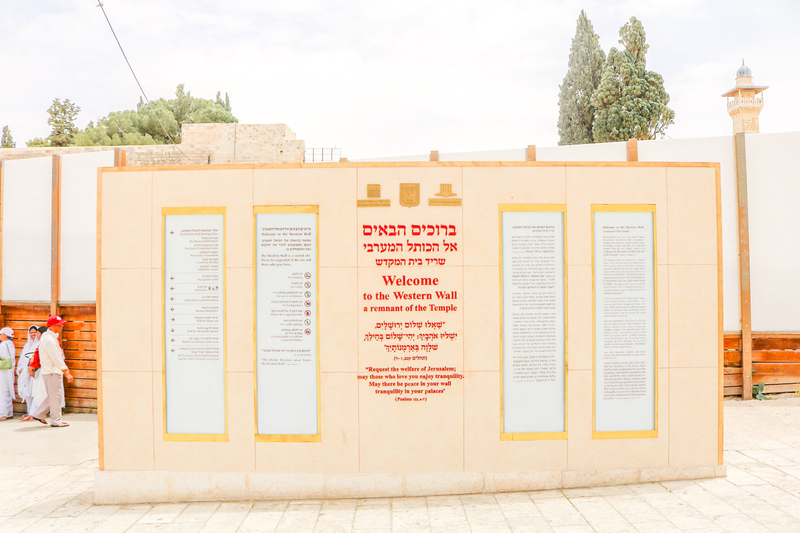 Two significant Jewish temples have stood at Temple Mount. The First Temple was built by King Solomon in 957 BCE. Nearly 500 years later, the First Temple was destroyed by the Babylonians and the Second Temple was built. The Second Temple was later destroyed by the Roman Empire in 70 CE. It is predicted that one day a Third Temple will stand, and will coincide with the coming of the Jewish Messiah. However, Jews are not permitted to enter or pray at Temple Mount, as it is considered too holy to walk upon. This belief coincides with Israeli law, which prevents Jews from entering the compound for security reasons, as it’s currently home to the Farthest Mosque, a seventh-century Islamic structure believed to be where the Prophet Muhammad ascended to heaven. Because of this, Muslims also view the site as being one of holiest places of worship in the world. Muslims refer to the mount as the Noble Sanctuary, and are permitted to enter and pray. There are eleven gates at the Noble Sanctuary open to Muslims. Christians are welcome to enter as tourists through the Mughrabi gate, but are not permitted to display any religious acts. Kai and I wanted to visit Temple Mount, but again, we did not plan our trip very well and our time in Israel coincided with Ramadan, where visiting hours to Temple Mount were very limited. So, like many of the Jews visiting Jerusalem, we had to be satisfied with a visit to the Western Wall. Because of Temple Mount’s entry restrictions, the Western Wall is the holiest place where Jews are permitted to pray – it is the closest wall to the former Temple. It is at the Wall the Jews mourn the destruction of the First and Second Temple. It is sometimes also referred to as the Wailing Wall, in reference to the weeping takes place at site over the destruction of the Temples. After spending some time at the wall, Kai and I decided to get lost. We walked down random alleyways, following cobble stone paths until they turned into mosques or churches that we stopped to admire. Slowly, we started making our way towards Mount Zion, where we would see Dormition Abbey, King David’s Tomb and the Last Supper Room. Above and below here you can see the Abbey of the Dormition. And with these last two shots, my camera died – would you believe?! I had just enough battery life to capture this beautiful panorama from the hotel’s rooftop before we had to head to the airport. 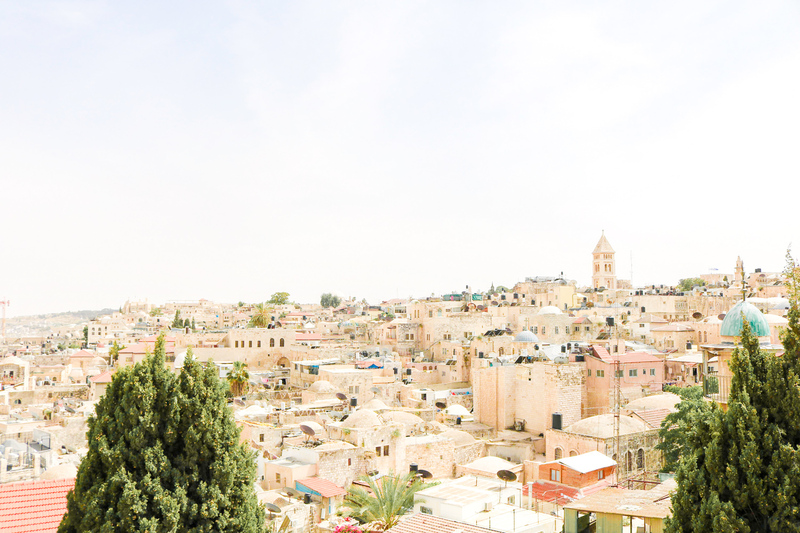 Looking back at these photos makes me get all the feels, because I really LOVED discovering Israel for the first time. I always have so much fun traveling with Kai, and this trip was just so relaxed and welcome after entertaining guests week after week in Amsterdam. And that’s a wrap on Israel! What do you think?! 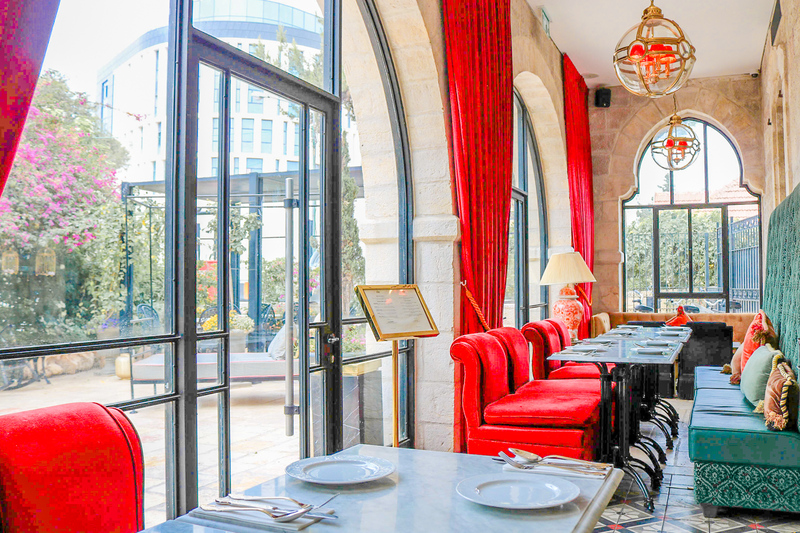 Should I post a Tel Aviv and Israel travel guide? !